Inbound-Wax Runner Kit B Design. 2 off containers securely locate Inbound-Wax Runner Kit B parts for transportation and storage. 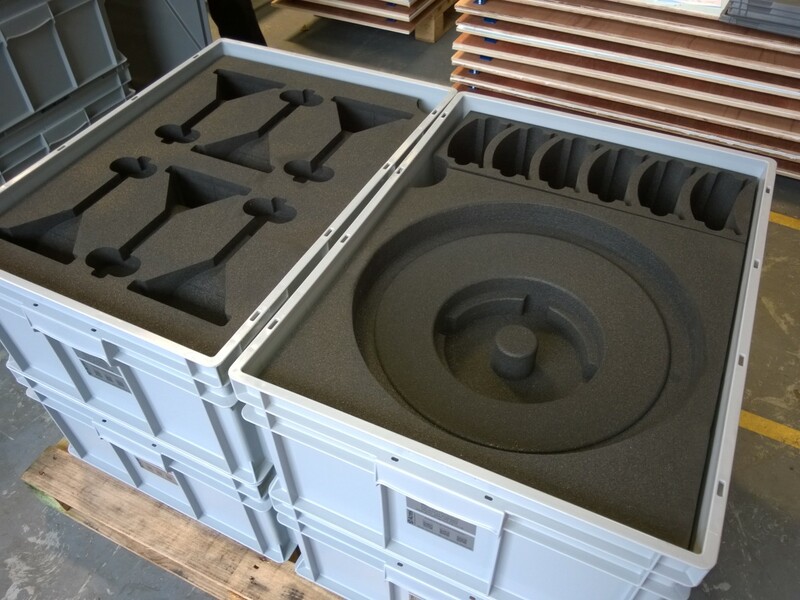 The parts fit in 4 off removable foam inserts which sit inside plastic Euro-boxes eliminating all metal to metal contact. The foam inserts feature highly detailed CNC profiling to fit the the parts securely. The containers are supplied with an easily removable hinged lid which protects the contents. The boxes have also had an identification label affixed to the outside so they can be referenced. The polypropylene Euro-boxes have a self colour grey finish & the plastazote foam inserts are black. Approximate overall size for each box with lid – 330mm (H) x 800mm (W) x 600mm (D).